34 Responses to It’s My Birthday! Cake and books are great indeed! Thank you, Trish! Thanks! I’m so old, I’m 28! I got two great cakes yesterday and thankfully more than plenty leftover for today! Happy birthday! Everyone should have an indulgent post now & again. And books + cake sounds pretty great too. Thanks, Stormy! Cake + books are the best! Happy birthday Amy!!! Cake and books is really the only way to celebrate 😉 Maybe throw in a Starbucks in there as well! Thanks, Aidan! It was a good one! Thank you! Yay for books and cake indeed! I have been having a pretty good birthday weekend! Thanks, Alisa! It was a good day! Mmmm… Cake and books! Happy Birthday! Thank you, Trisha! And mmmm indeed to cake and books! Happy belated birthday! I’m sorry about Con, but I hope you had a splendid day regardless 🙂 What books did you get? Awww, I hate that you didn’t get to meet them, but I hope you had a very happy birthday anyway! Thanks, it was a good one! HAPPY BIRTHDAY, AMY! I know it’s horribly late, but you can blame sickness for that. It’s a shame you didn’t get to see your Star Trek people D: But I know it will happen one day because I’ve never known anyone who loves that show like you do! Thanks, Chiara! And I always comment late so no worries there, ha ha! I have seen other Star Trek actors, just not all the ones at this particular convention. But hopefully they’ll come back to town sometime! Bummer about the Nashville comic con, but awesome picture! I hope, even though everything didn’t work out quite as you’d hoped that it was still a lovely birthday and that it is only the beginning of a year filled with books and laughter and real life adventures (not just the book variety) and an awful lot of love! Thanks so much, Annie! I did have a pretty good day and got some books I’m excited about! Happy belated birthday-my birthday was on the 26th, so we’re like 24 hours apart (well, and a few years, since I’m pretty sure I’m older than you lol). Hope it was a good one for you! Oh how fun! Happy belated birthday to you, too! Haha, you can definitely tell it’s been a busy week for me. I bookmarked this post on Feedly when I saw it go up and thought “Oh yes, better mark this so I remember to tell her happy birthday later!” and yet I’ve been so busy that I haven’t actually gone through my bookmarks all week until just now. Whoops! 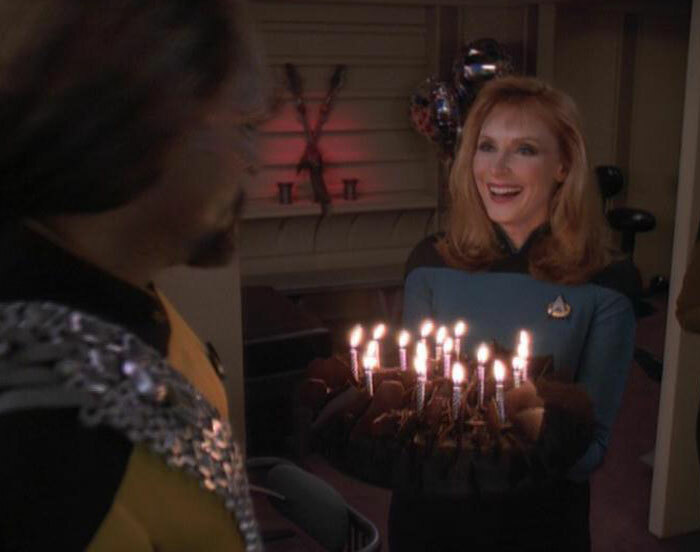 So it’s very belated, but all the same I wish you a very happy birthday and I hope you have had an amazing week 🙂 Cake and books are never a bad thing, though it’s too bad you didn’t get to meet the Star Trek people you wanted to. Boo! Hopefully some other time! I understand completely, and thank you! I did have a good birthday weekend, and I do believe I will have more opportunities in the future to see Trek actors.